Grinding tools are used extensively in industry and manual trades for treating surfaces and for separating and cutting objects. 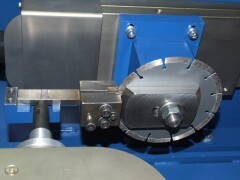 Since a break or failure of the grinding tool can present a severe hazard to people and machinery due to the high levels of energy released, high standards are placed on the mechanical and breaking strength of grinding tools in the appropriate European safety standards. Among the other duties are also the constant development and modification of the test procedures to keep up with the technological advancements in the tools as well as participation in the relevant national and international standard-setting bodies. The test laboratory for grinding tools also supports the institutions for statutory accident insurance and prevention, manufacturers, and grinding tool users in investigating damages and accidents.